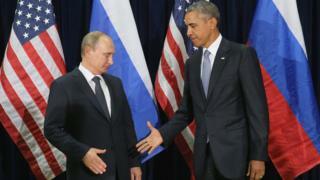 Did Putin upstage Obama at UN Syria summit? Diplomatic protocol could not disguise the frosty, awkward relations between US President Barack Obama and Russian President Vladimir Putin. The chill was all too obvious at the United Nations in New York: in the steely look that Mr Obama gave Mr Putin at lunch - leaving the Russian leader until last to clink wine glasses - and in the perfunctory handshake before their talks, which Mr Putin called "surprisingly very frank". That is usually diplomat-speak for a heated argument. It was their first formal face-to-face discussion since 2013, though they have had some brief encounters since then. Mr Putin made light of that, stressing that they were in regular phone contact. Judging from the reactions of media commentators, Mr Putin appears to have won on points overall, and not only in the "duel of speeches", as Germany's Der Spiegel website described it. Many point out that he skilfully kept the world's focus on the Syria conflict, despite Mr Obama's condemnation of Russia's intervention in eastern Ukraine on the side of pro-Russian rebels. And for the Russian domestic audience Mr Putin appeared sitting proudly at the top table, as an equal with Mr Obama in tackling the Syrian crisis. So Russia no longer looked diplomatically isolated, despite the Western sanctions imposed for its pro-rebel activities in Ukraine. In photo opportunities Mr Putin smiled more than Mr Obama - though some saw Mr Putin's expression as a satisfied smirk. The Russia leader had stolen the spotlight at the United Nations, according to the AFP news agency, with a "swaggering push on the Syria crisis". And the Associated Press said the meeting "highlighted Putin's ability to command attention and shift it away" from Ukraine. The two leaders pulled no punches in their UN speeches, attacking each other's policies in the Middle East and Ukraine. But the body language and mood music drew almost as much comment as the content of their speeches. Popular Russian tabloid Moskovsky Komsomolets (MK) told its readers that such silent photo ops were "a customary format for the Americans" - glossing over the icy atmosphere. It also made much of the fact that they met for more than 90 minutes - instead of the planned 55 minutes - in the "Russian Room" at the UN. That is the nickname because the room was designed by Soviet architects who helped build the UN headquarters, MK said. It is a small room, with space for only three delegation members on each side, "and even so they feel like sardines in a tin there", MK reported. There was plenty more point-scoring in Russian media. News website RBC reported that Mr Putin's UN speech - his first in 10 years - "lasted a little over 20 minutes and began after the allotted start time, because Obama overshot the duration rule, by speaking for 45 minutes". Russia's state-run Channel One TV devoted hours of airtime to a special debate on Mr Putin's speech, with Russian political heavyweights and a studio audience. Most Russians rely on state television for news. There was lavish praise for the speech - despite the fact that Mr Putin had rarely glanced up from his notes. In that respect, it could be argued, Mr Obama won on presentation, with a more measured delivery, addressing the whole hall. One leading Russian MP, Vyacheslav Nikonov, called Mr Putin's speech "clear, very focused, weighty, without frills, calling a spade a spade". But when an American journalist on the panel, Michael Bohm of the Moscow Times, tried to explain US hostility towards Syrian President Bashar al-Assad he was shouted down by participants, including moderator Pyotr Tolstoy. "You haven't been to Syria, so I don't think you have reliable information about who is fighting, or for what," shouted MP Sergei Zheleznyak, Deputy Speaker of the Duma, Russia's lower house. And Tolstoy told Bohm that President Assad "will stay in power as long as the Syrian people need him there - it's not up to the American people". Bohm's riposte, that "he [Assad] wasn't legally elected", could barely be heard. Elsewhere, however, some Russian commentators were less impressed with Mr Putin. Vladimir Varfolomeev of Moscow Ekho Radio tweeted that Mr Putin "needn't have flown to NYC. He could have got [ambassador to the UN Vitaly] Churkin to read out this rubbish". Commenting on the leaders' "bizarre toast" at the UN lunch table, Max Fisher of US news website Vox said Mr Obama displayed "undisguised loathing" and "truly, this is side-eye diplomacy at its height". Mr Putin was "ever delighted in his ability to troll the Americans, smiling at having forced himself back to the grown-ups' table". The Politico website in Brussels reported that "to some, Putin managed to steal the show", helped by his interview on the CBS TV show 60 Minutes the night before. "Putin has had a great couple of days in terms of public relations," commented Michael McFaul, Mr Obama's first ambassador to Moscow. Tension even surfaced over who had suggested the Obama-Putin meeting. Mr Putin chuckled and said "the American partners proposed this meeting, as my aide has already said". US officials remained tight-lipped about that. Who would Russia bomb in Syria? Video Syria conflict: Where might there be consensus? What are Putin's goals in Syria?